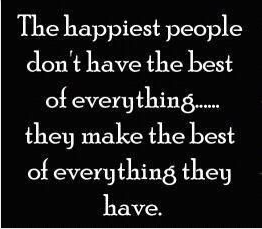 I love having give aways...I love sharing, I love meeting new people, I love it all. So here's another little give away. My neighbor has a new grandson, so I was looking through my stash (which isn't very big these days...I'm trying the theory of use what I have). I realized I still have "I Spy" fabric and some of the squares are already cut!! 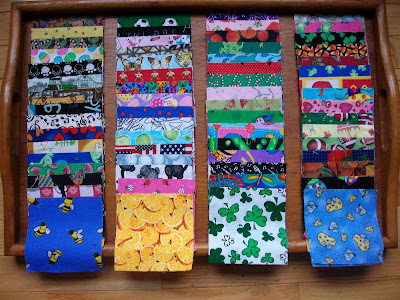 I went on a cutting frenzy and cut all my I Spy fabric into 4 1/2" blocks. I know what you're thinking..."I Spy", who makes those anymore? Are you thinking that?... maybe not...I'm just thinking you're thinking that. Anywhoo, whenever a teacher has a baby at my husband's school or a friend has a baby, I most always make an I Spy quilt. People still come up to me today and say...you know that baby quilt you made my son, well, he loves it and still drags it every where. Now that he's older, he loves the matching game. I Spies are great for the bright colors for infants and as the child grows older, the quilts become a learning tool for colors, letters, shapes, animals, objects almost anything. You can turn this older I Spy idea into a new look with the sashing fabric you choose and the border fabric. 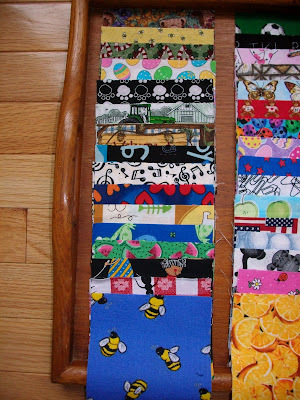 Most of the time I use a great black and white polka dot for a border or sashing and always for the binding. It really makes the quilt pop. Yikes...I really tooted the I Spy horn here...you'd think I was starting an I spy company...all I'm doing is giving some squares away!!! I take one set of squares and make the quilt. Set it 8 blocks x 8 blocks (32" square) or 7 blocks x 9 blocks (28" x 36"), this measurement is without sashing or borders. then you take the second set of matching blocks and make fabric cards to play a matching game when the child is older (they love this). or make 2 quilts out of the 2 sets and forget the matching game. No matter how you make them, these squares are always great to have on hand for that quick, small quilt you need to make for a gift. All my fabric is pre-washed and comes from many different place. I have I Spy fabric from quilt shops, Jo-Ann's and Walmart just to let you know. Easy rules: just leave me a comment and I'll pick a winner next Saturday September 19th. What a fun giveaway and the fabrics are all cut and ready to sew up.... even better. Please count me in. I love making I Spy quilts for babies and I am having two new grandchildren...one maybe this weekend and another in 2010!! I would LOVE to win your giveaway, so please count me in. Wonderful idea for a giveaway, I really hope I win! These are lovely fabrics. I Spy quilts are a classic and I love sewing squares! I usually cut mine at 6 1/5 as that was the width of my ruler then - LOL! I still think it's a good size. Good luck to everyone for the giveaway! Karen what neat I spy fabric, these would be great in charity quilts. Great collection - it's hard to collect so many prints without taking up a huge space in your storage! Thanks for the giveaway! I'd make this into a wall hanging for a wee one's bedroom! Oh my, all cut and ready to go, how wonderful! Thank you for the chnace! I've always wanted to make an I Spy quilt! Your fabrics are all so cute! How cool of you to cut the squares for us! 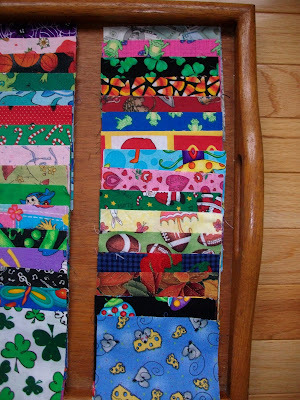 I would love to have them since I am in the process of making quilts for all 9 of our grands! (2 done so far) Pick me! Nice giveaway, I just wrote this morning that I have entered countless giveaways and never have won. This would be nice as it is all cut out. I just donated a huge bag of I spy fabrics to a friend. It would be funny if I win. Good luck to everyone and thanks for your generosity. What a delightful giveaway! Please include my name in your drawing. You are so generous! So lovely fabric and such a good idea.I would love to make one. You are generous. How I finish our local fabric store sells all these designs. Almost always are in floral. those are really adorable! I'd love to see pictures of some of the other I spy quilts you've made! Oh, how nice! I love the idea! I hope to win!!!! I've never actually made one, but have some fabric set aside to make for a grandson! But I need more, so this could be very opportune! I hope I win! Thanks for giving me a chance! These fabrics are such fun! I'd love to see a photo of your finished I Spy quilt. Here's hoping I win and can make one for the next office baby! what a great collection of squares you have there! I'd love to make them into a fun quilt! And postage to me would be cheap...I'm in New England too! wonderful giveaway!i`d like see the photos of I spyquilt. Hoopin i`ll win and can make a fun quilt with these greats fabrics.thanks for giving me a chance in this giveaway. What a wonderful giveaway. I would use these blocks to make matching quilts for my two nephews - ages 2 1/2 and 9 months. Count me in, such a fabulous give away. Please add my name to the growing list of folks who are hoping to be lucky enough to win this generous giveaway!!! Thanks, Karen....you are a great quilty friend to all of us! Like this giveaway? Karen,my jaw just dropped! I absolutely LOVE it!!! Your timing couldn't be better. I just completed my very first quilt,so I do not have a stash. At our last quilt group meeting several of the gals were trading fabrics for "I Spy Quilts". (OK,I will admit I was drooling a bit when I saw their stacks of fabrics. )You can imagine how precious this generous offer is to a newbie?! Yes,count me in! I think "I Spy" quilts are fabulous gifts for new babies! As soon as they can identify color they are intrigued by the different shapes. As they are learning to talk, they can identify the items on their "blankie". 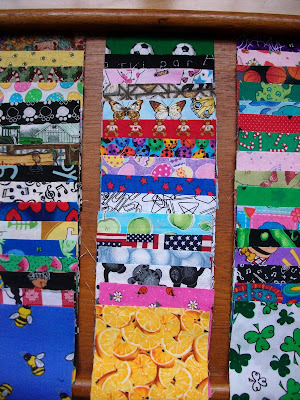 Yes, people still DO make I Spy quilts and I would love your fabric!! I have a friend who is having a baby in November and this would be perfect for her. Thanks for including me in your giveaway. Lovely fabrics! Thanks for giving me a chance! The fabrics are ready to do!, please count me in!, I'd love to have it! I really love the idea of making the quilt into a matching game. Love your fabrics and giveaway.. Please add me to the hat too! Holey Smokes....that is a lot of different fabrics. I've never made an I-Spy quilt. I love the idea. Thanks again for all the great tutorials and the great blog. I love novelty prints. Your are fabulous. I would have so much fun putting them to good use. Oh me please! I've been collecting for a large I Spy for picnics, this would really boost what I have. I love the fabric and already cut, how nice. I hope I win. My grandkids love the I spy books. Wow what a generous giveaway - it would take me forever to collect all that fabric! And I never thought of the matching game use for it! I hope I win this for my little one! I love "I spy" quilts. I would love to win the blocks you cut. Such a great giveaway!!! Thanks for sharing! What a great giveaway! Beautiful prints and all cut up too! Any child would love to get an I spy quilt! Love your TTT and your give away is very sweet too! Thanks for sharing not only your ideas but your fabric!! I love I Spy quilts for kids! Wonderful fabrics for the giveaway. Thanks for the chance! I like the idea of the matching fabric cards. So, I really, really want to win. Wow - the fabrics are wonderful!!!! Great collection of fabrics and you even cut them into squares?! Wow! What a generous giveaway, count me in! I love a give away and I spy quilts..especially when the squares are already cut. Put my name in the pot. I love I Spy quilts! I was just browsing Etsy and Ebay for some new squares this week. I love the selection you have. My three year old grandson would love a quilt made from these fabrics! I would love to make an I Spy quilt for the Tootie Babies! Hope I win! What great fabrics! I'd love a chance to win them. What a great lot of fabric , I'd love a chance to win , thankyou ! I am making matching quilts for my niece who works with autistic children. I look for panels (ABCs or pictures)and buy two of them. Make one into a top and then cut the second one to make pieces for the children to match. I also use different colors on the back of the tiles so she can revert to a match the colors task, if necessary. What a great giveaway! Not only do we not have to purchase so many different fabrics, we don't have to cut them up either! Please count me in! I love all of those fabrics! I have a new great nephew and would love to create an I Spy quilt out of those wonderful squares--please put me in for a chance to win! Thanks so much for the opportunity! Yes I like this one. I had never heard of I Spy quilt, but what a great idea!! And I just learned tonight that I may have a great recipient of a quilt like this! I too enjoy making I Spy quilts. Some for family and some for charity. Would add greatly to my fabrics for a variety. Throw my name in the hat too! What a great give away. I use 4 1/2" conversation prints in happy blocks. These would add quite a variety to my current collection. Thanks. These would be great to add the ones I have, Karen! Then I'll have enough to make a nice sized quilt for a grandchild. Thanks for counting me in. Karen, I have seen and admired I Spy quilts and would love to make one. Please enter me in your giveaway. What a fun giveaway. I would love to make an I spy quilt. You have such sweet fabrics. I never made a "I spy" quilt. Great idea to use your stash in such a way. Thanks for the giveaway! The last baby quilt I made was for a friend with different animals and the alphabet and everybody loved it at at baby shower. I would love to see your finished "I spy quilt"! I've never made an I SPY quilt, but I always thought they looked like fun. I do Giveaways, but rarely enter - would love these though - I've never been a collector, but have bought a few for a quilt for a grand nephew! My oldest granddaughter, who was married a year ago, says babies are in her future, so I'd love to get a head start on baby quilts. Thanks for making this great giveaway, Kathie L.
Oh, I would love to make an I spy quilt for my grandson who at the age of two is learning new words every day! What a great giveaway! oh no another wonderful giveaway! guess it wouldn't be fair if I was lucky enough to win this one too! I've always wanted to do one of those quilts! Please count me in. I've never made an I spy quilt but would like to try it. I love the matching fabric cards idea. I would really love a chance to win these I Spy quilt squares! Please throw my name in the basket and thanks so much for this chance and for the creativity you always have on your blog! Oh wow, what a great giveaway. I've always thought the eye spy quilts were so fun. Thanks for entering me in your giveaway! I know 4 people having babies in 6 or 7 months, theses would make the most adorable quilt for one of them. Please accept my entry. Thanks! I'm behind by 3 or 4 baby quilts so these would really come in handy!! Oh Great! With lots of newly married nieces in the family I'm sure there's a baby race on so this would make a perfect make ahead gift. Thanks for putting my name in. Please sign me up for that give away. I have 3 grandsons that would love a new quilt. The matching game sounds like something they would love. That for the Tues Tool time I love it. In all the years I have quilted, I have never done an "I spy" quilt. I would love to make one for a very special little one. What a great giveaway! I'd love to make an "I Spy" quilt for my new nephew. I made an I Spy quilt for my hairdressers new son and she loves it! I'd love to win more squares..I'm making quilts right now to donate to the Ronald McDonald House in Maine for a friend of mine who stayed there while her daugther was in the hospital. What another fun giveaway, you are so generous. I would love to make an 'I spy' quilt for my nephew. Love the matching cards idea. Wow, I've never made an I Spy quilt, this would be a fantastic start! Thanks for the give away! What a wonderful giveaway. I'd love a chance to win too. I love I spy quilts! I've made one, but have lots of nephews who would love one!! I've got to try for this one...nothing I have in my stash looks like these fabrics! This gives me a good head start for future grand babies! LOL I've also got a giveaway posted today. What a lovely giveaway ! Please include me for a chance too. Thanks ! I have one I spy quilt and now three grandkids, so I'd love to win more fabric. Such a generous give away. What fun fabrics you have in the mix. Count me in please. Oh what a great give-away. Perfect. I've been trying to collect I spy fabrics, but having to get min 1/4 yd cuts is hard! I think they're wonderful quilts. Count me in! Being a new gramma for the very first time, I would LOVE to win some I-SPY blocks! p.s. I love your TOOL TIME TUESDAYS! These squares are just so so GREAT! My imagination already started to work, how could I use them if I would be the lucky winner. I would be most happy to win them and make something beautiful. Please enter me to your give away. Hi Karen, I just found your blog and I would love to be entered into your great give-away.. How generous of you. You have a great blog and I'll be back to visit. Thanks for the chance to win the eye spy blocks. Oh, I would LOVE to win the I Spy squares!! I have been wanting to make my nephew (2 yrs old) a I Spy quilt but he would be 21 by the time I collected enough fabrics. This would make a great Christmas gift. What a great collection! I love I Spy quilts and don't think they're out of fashion at all. And now to have found you having a giveaway, what could be nicer??? Great giveaway! I'm new at grandparenting..well, I have 8 grandkids all 5 and under, so an ispy quilt would be just right for their ages now. I'd love to win this bundle! I like the idea of a fabric matching card to play...I've not see that idea before. THanks. Sign me up! Those are super cute! What a great give away!! I like your fabric choice....Have a great day and again love from the rainy Holland. What a list with names!!! Thank you for this nice give away! I have 9 grandkids and have made 2 I-Spy quilts. My grand kids really love them and each one wants their own so I would truely love to win your squares, they would be used and loved. Thanks for the chance to win something wonderful. This is a gret idea for my grandbabies, they're turning 1 in a few weeks to a few months. Thanks for the idea! Would love to win, this would be a great way to more variety in a quilt. Thanks for the chance. Wow! I was just in an I spy swap and I could really use some more! I really love the orange wedges fabric! Perfect timing for the "I Spy" I'm making my granddaughter for her third birthday in January. These fabrics would be a perfect addition to what I already have. This is a great idea. I have nine children and would LOVE to make one of them a quilt with I Spy charms! What a fabulous giveaway, I'd love to make one for my kids! Oh my word! I would love to win this! I wanted to make an I spy quilt for my 3 year old niece, and my 10 year old daughter wants to help. I love your I spy fabrics and ideas. I would love a collection of I-spy fabric. I have very few pieces suitable for that project. Thanks for the giveaway. My boys would love this!! Thanks for hosting this giveaway! Hi! 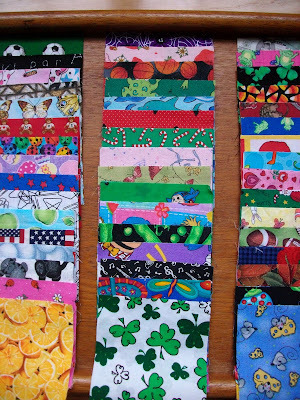 I would love to make an I spy quilt, but have'nt got the fabric needed to make one. Please enter me in the giveaway. Thank you for the Tool time tuesday, they have given me a lot of ideas! Are you kidding! All those beautiful fabrics and already cut up! Please count me in! Since I have a small stash of these and 4 grandchildren under 3, I would love to win more! Simply eye candy...how lovely. Thanks for the opportunity to win! It would be sooo amazing if I won these. I've been looking to do a bit of sewing lately..
What fun. Thanks so much for sharing. I've started an I Spy quilt and could use some more fabrics for it, maybe I'll win. Oh, my gosh! I love making I Spy quilts. I have two great nieces I would love to make them for. What a generous giveaway! Please, oh please draw my name!